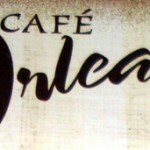 Cafe Orleans is a pretty classy joint. Think stained glass and elegant decor (by theme park standards). It all starts outside. Fancy fonts and florals surrounded by wrought iron. Not an animated character in sight. But I don’t want you to think this place is stuffy. It’s totally not. 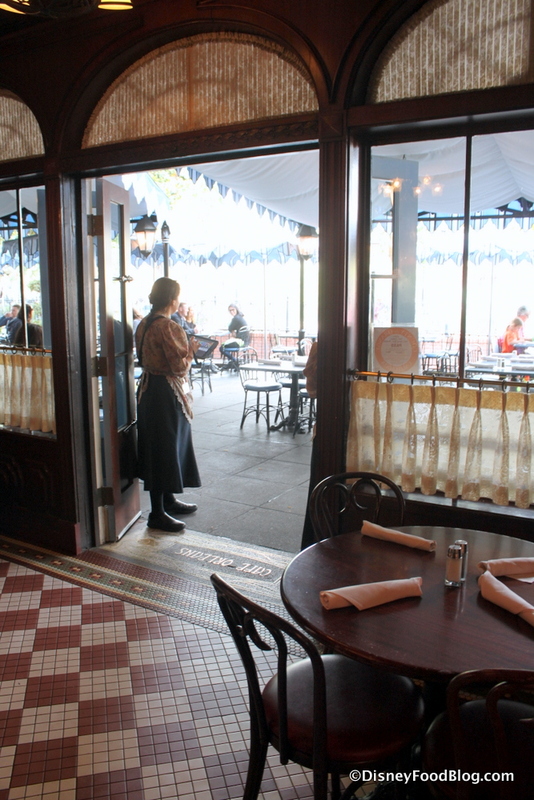 Inside, you find rich, carved wood details, floral sprays, and vintage chandeliers. 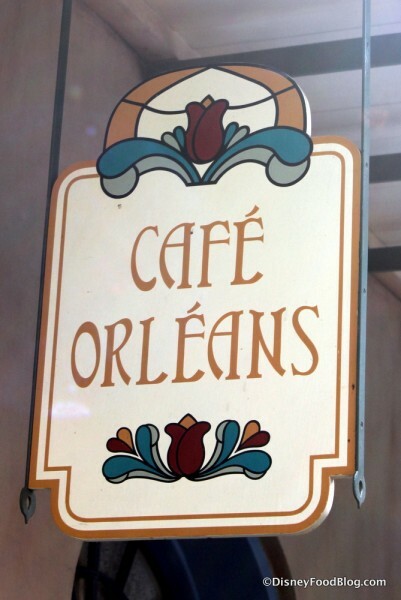 After all, Walt Disney himself was here back when Cafe Orleans was called the Creole Cafe (it became Cafe Orleans in 2006), so there are some truly classic details. In fact, this stunning espresso machine is basically as old as the park itself! There’s really so much history here. It’s a beautiful piece machinery, complete with history. 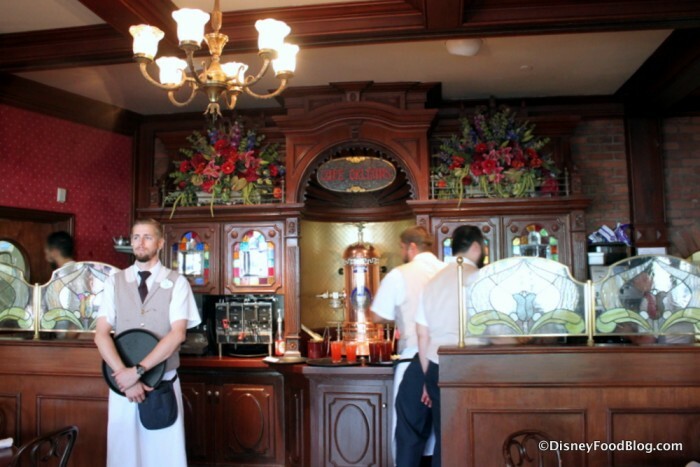 (It’s said that Walt himself enjoyed cups from this machine). Moving on, you’ve got functional and stylish — if somewhat minimalistic — seating surrounded by richly colored wall treatments. Framed prints and artwork as well as heavy moldings complete the look. 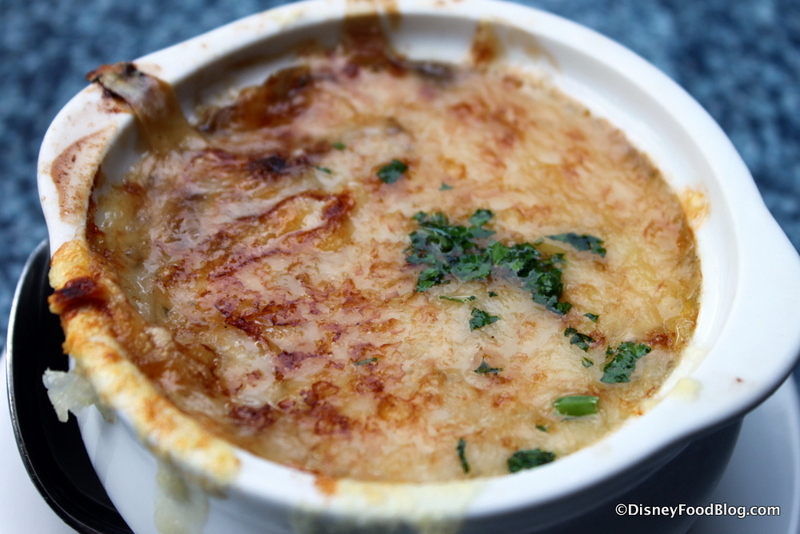 The patio seating at Cafe Orleans is also pretty great. When the weather is perfect (as it often is in SoCal), you can’t beat it. It’s like a meal and a show, where people watching is your entertainment. Once you’re settled in (after some highly recommended exploring), it’s time to order and eat. Before you even enter the restaurant, you can get a glimpse of the menu. It’s not massive, but it contains a few genuine Disneyland gems. Lots of traditional New Orleans cuisine, as you’d expect. 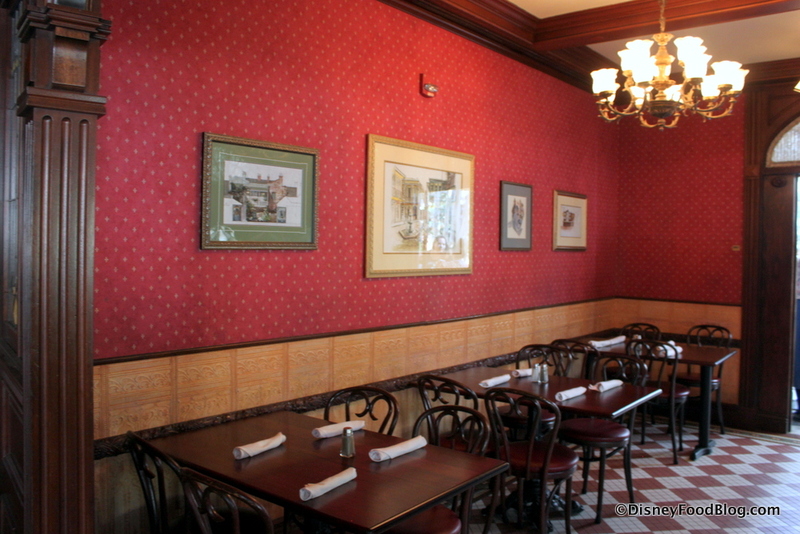 Once you’re seated, you’ll get a paper menu. 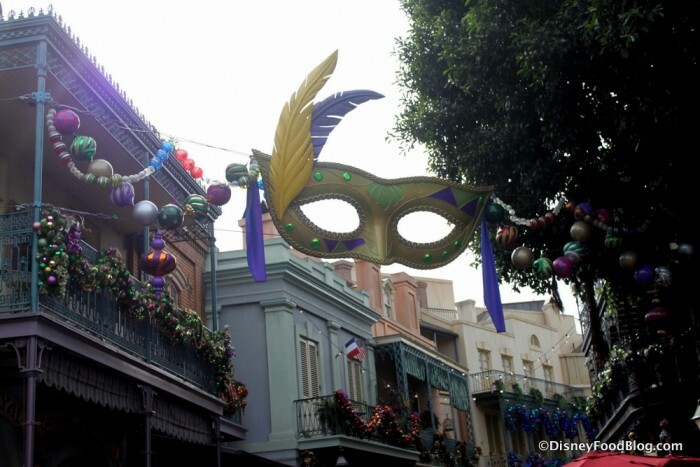 Take time to browse through all of the options, then Laissez les bons temps rouler! 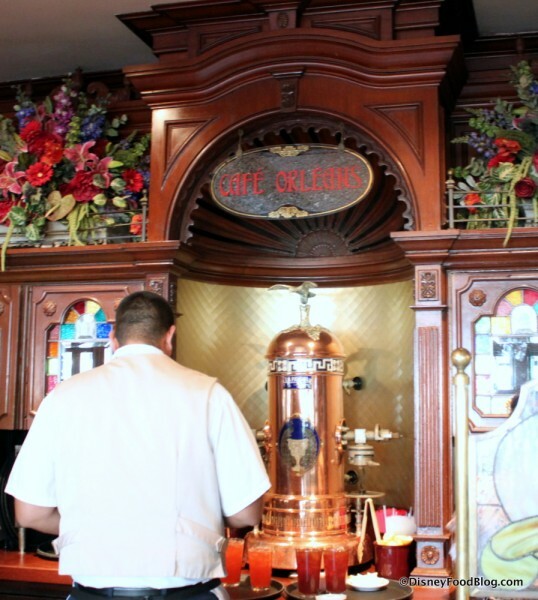 Again, Cafe Orleans is a Table Service location, so your server will take your order. To provide you with an accurate report of the goings on, I ordered, you know… a few things. I’m all about quality control. My starter isn’t pictured above, but I always get a bowl of the French Onion Soup. 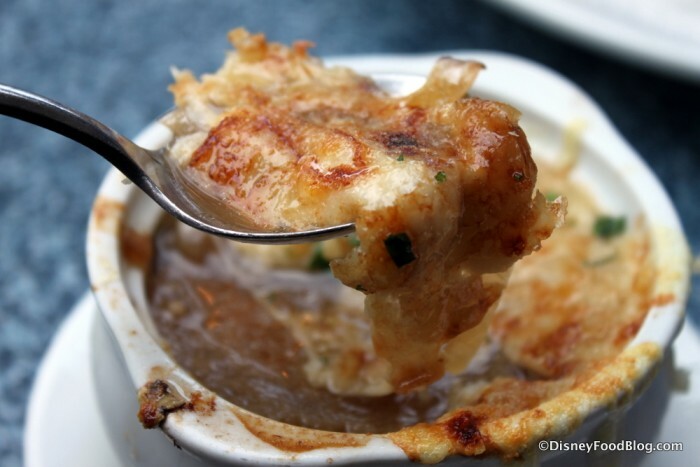 It’s because of the delicate balance of caramelized onions and traditional broth. 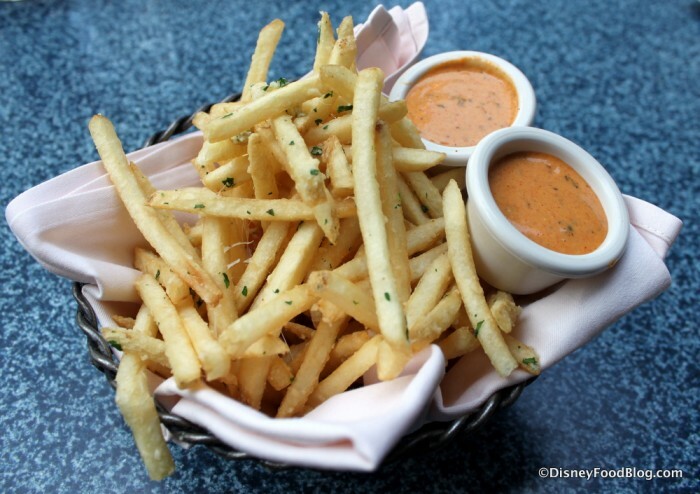 Another must-eat Cafe Orleans menu item are the Pommes Frites. That’s fancy for French Fries. These happen to be cooked light gold, tossed with garlic, parmesan, and parsley, and served with a side of Spicy Cajun Remoulade. Notice I said “a” side. I always ask for a second, because one is just never enough. I recommend you do the same. 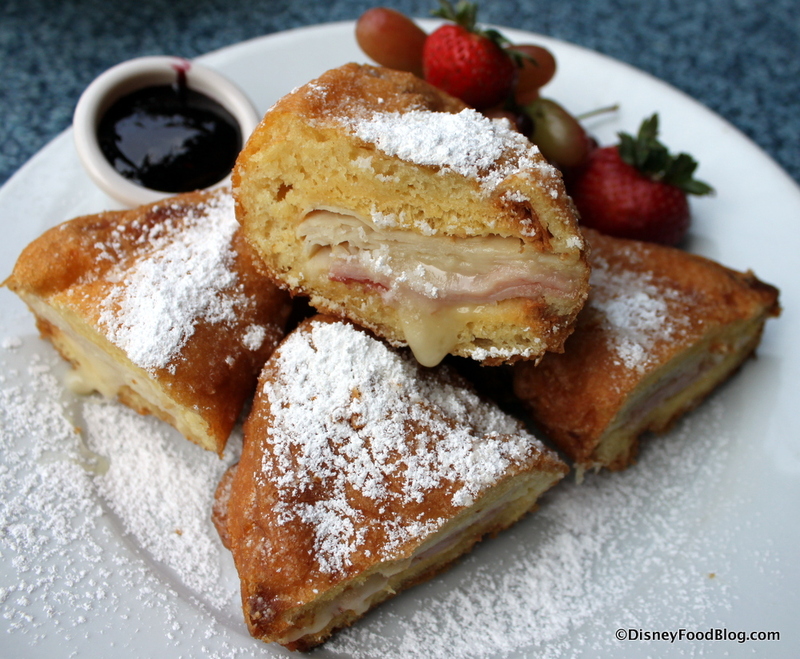 All right, so obviously it’s just not a trip to Cafe Orleans without ordering the signature Monte Cristo Sandwich. Layered slices of turkey, ham, and Swiss are coated in batter then deep fried. 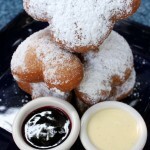 Finally, it’s all dusted with powdered sugar and served with a side of berry puree. 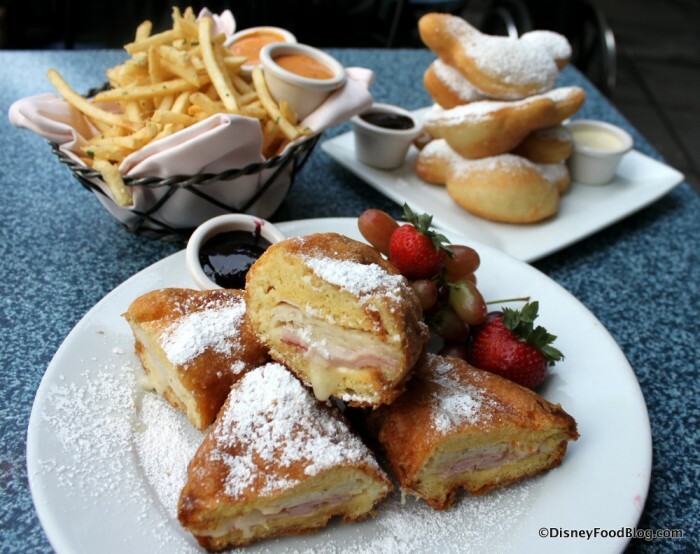 Now, you can find this iconic sandwich here and at the Blue Bayou Restaurant, also in New Orleans Square (it’s gonna run you a few more bucks in the Bayou, though). 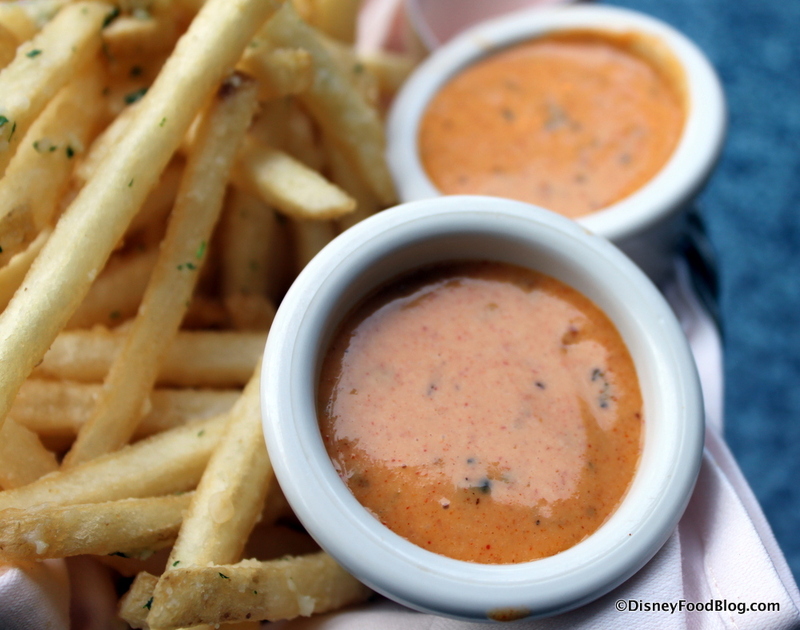 No matter where you’re dining, please don’t leave Disneyland without enjoying this sweet-and-savory, airy-and-crispy, and not to mention MAMMOTH Disneyland classic. Ooh — and here’s a tip! The Monte Cristo can be ordered vegetarian (just layers of cheese) or with only one of the meats (if you have a preference for one over the other). Just when you think, “Okay, AJ. 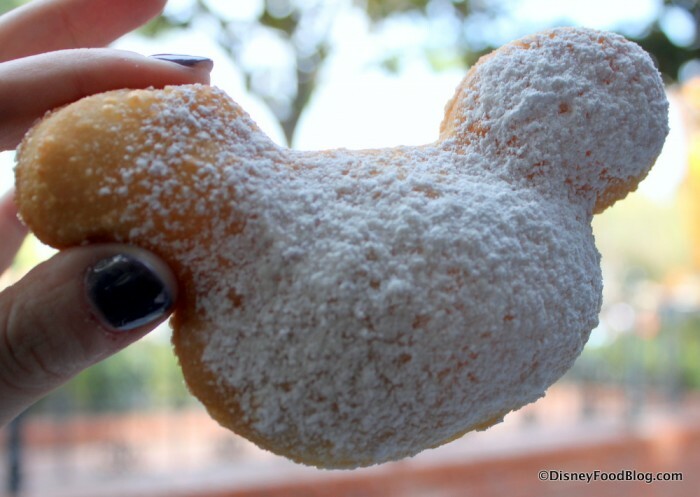 Exactly how many ‘must-eats’ can one place hold?”… well, I’ve got one more for you: Mickey Beignets. 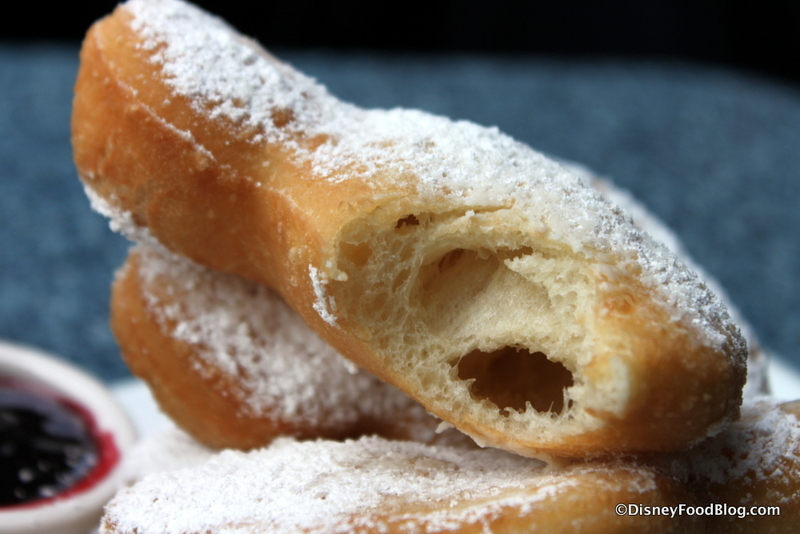 Beignets are basically like the best donuts you’ll ever eat. 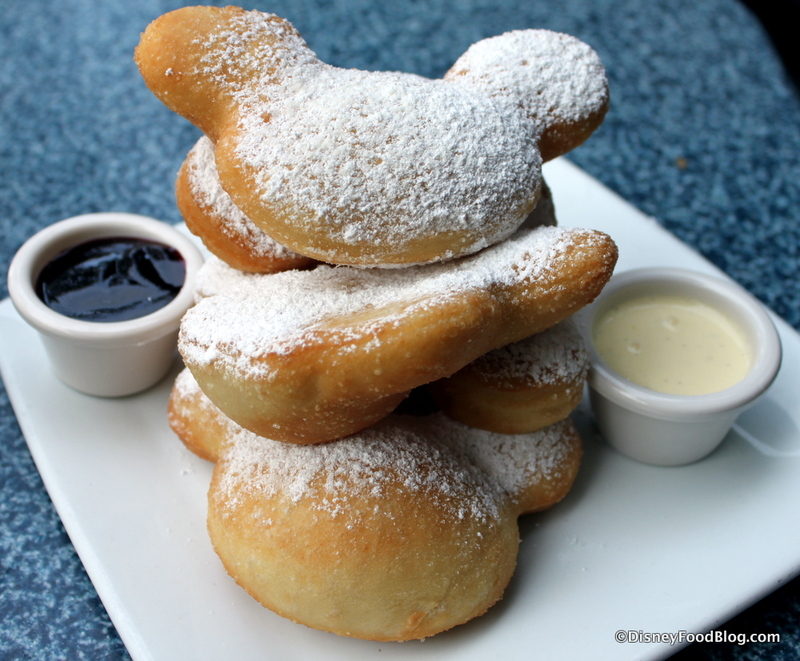 And these puffy, pillowy, golden pastries are Mickey-shaped, and served with vanilla and berry dipping sauces. 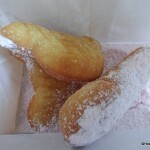 The air pockets lend the beignet its signature lightness, and these ones are always spot-on. By the way, if you need a Mickey Beignet in your life (and trust me when I say that YOU DO) but can’t nab an Advance Dining Reservation at Cafe Orleans, the Mint Julep Bar in New Orleans Square also sells them in to-go fashion. Just resign yourself to a beard of white powdered sugar and go for it. Care to see all of this in motion? Then pay a visit to Cafe Orleans yourself by way of our YouTube Channel! It’s almost an embarrassment of riches for Disneyland when it comes to dining, so please know that I don’t take it lightly when I say that Cafe Orleans continues to land firmly on my Best Food in Disneyland list. And even though I’ve practically eaten my way through the full menu, I stand by my recommendations for these classic choices. Serving up more than one iconic dish with a hearty side of Disney history, Cafe Orleans really has it all. Should you ever find yourself in New Orleans Square — or anywhere in the general vicinity — please take my advice and don’t miss it! 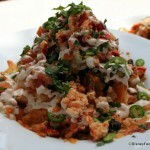 Do you have any must-go Disney Parks restaurants? Let us know in the comments! 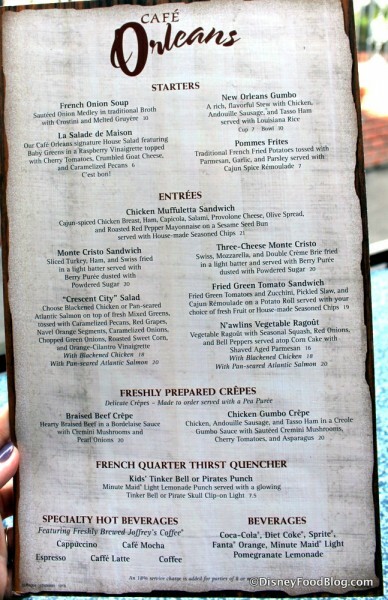 How recent is that picture of the outdoor menu? I’ve been dying for the fried green tomato sandwich to reappear!!!! If its not there i’ll stick with the cup of soup and pomme frites, but man I would kill for one of those sandwiches again! 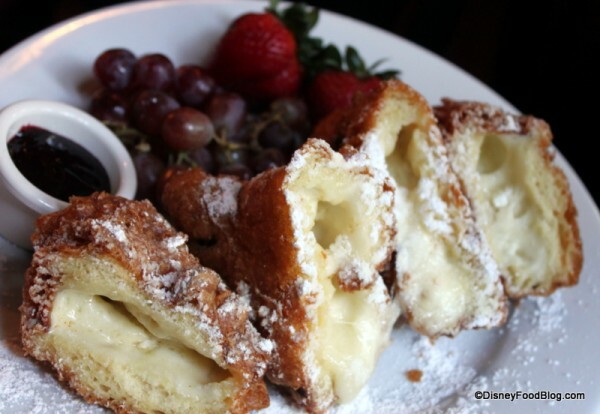 Omgosh, I’d pick this place just to get a classic Monte Cristo! I know they aren’t the healthiest sandwich, but I’ve had one two times in my life and they’re a great treat every few years or so. lol I can’t get them anymore where I live, so I wish you could get them in WDW! 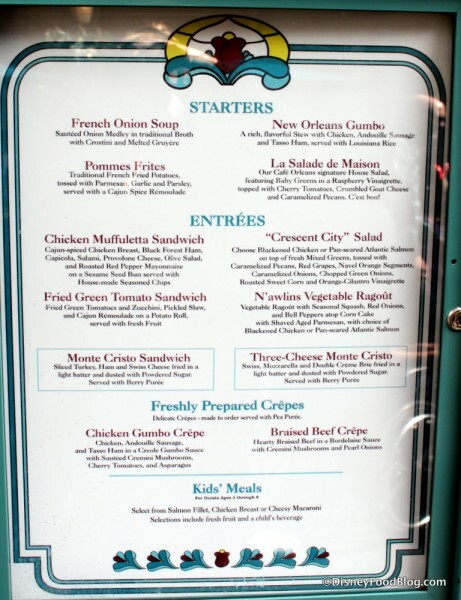 Angelina, that picture of the Cafe Orleans menu is from March. 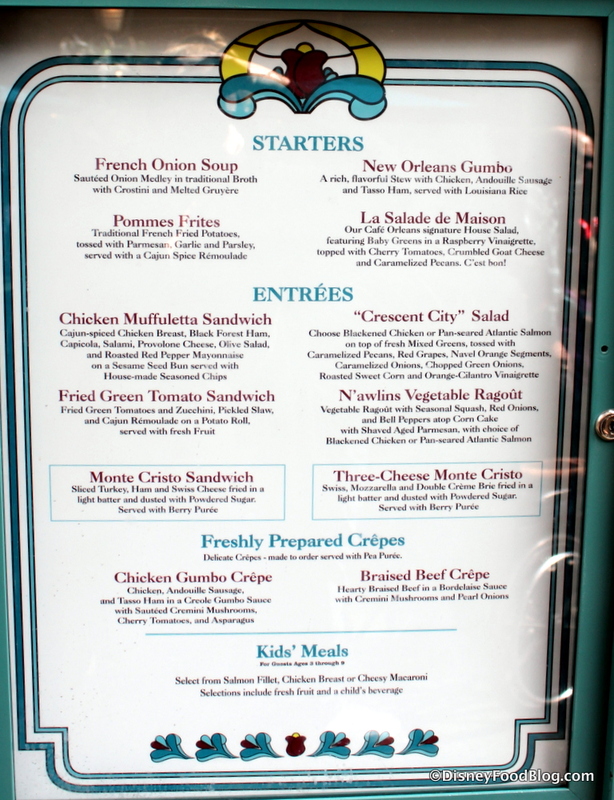 Unfortunately I don’t see the fried green tomato sandwich on the Cafe Orleans menu online. Bummer! 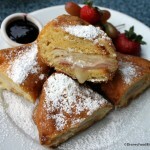 My husband and I lovingly refer to the Monte Cristo as the “ham doughnut.” It is one of our favorites!